Jonathan Kasting grew up in the Cincinnati suburb of Wyoming, Ohio. He attended Miami University for undergraduate studies and graduated from the University of Cincinnati College of Law Class of 2016. During his time at law school, Jonathan was actively involved in the entrepreneurial community and interned at the Entrepreneurship & Community Development Clinic where he assisted small businesses meet their legal needs. 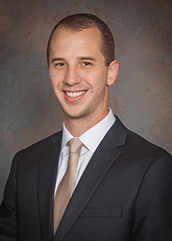 Jonathan is a licensed member of the Ohio Bar and has experience representing small businesses, aiding non-profit organizations, and handling regulatory compliance matters. Jonathan currently works in the Financial Crimes Compliance Division at Fifth Third Bank where he assists the bank comply with BSA/AML regulations. In his free time, he enjoys studying history, relaxing at his family lake house, and attending networking events.